During this retreat, you will dive into the silence of your consciousness. Turn your gaze inwards, fuel yourself in nature, give your body and mind rest. You will arrive gently in the now and start to enjoy and feel more intense. In a safe atmosphere, you can be sensitive to your inner process and work on it. Villa Shanti is a wonderfully quiet location, overlooking the two mountain villages of Marciana Alto and Poggio. During this retreat, you will be staying at Villa Shanti. The villa is located on Costarella, the old coastal road that connects Marciana Marina with Marciana Alto. It is a wonderfully quiet location, overlooking the two mountain villages of Marciana Alto and Poggio. The villa is adjacent to the nature park where you can see moufflons and wild boars coming to the water spring every evening. Moreover, the villa has it's own well with the best quality of drinking water, which has been tested and corresponds to the water of the Fontane of Napoleon. The garden is 3000 square meters with nice seating, sun loungers, and hammocks. During July and August, there will always be a light wind so it is not too hot. In a few minutes walk, you will see the beach of Marciana Marina, it is the nearest beach. In a few minutes, you will see the most beautiful hiking trails. While behind the house in about 800 meters, there is the cable car to the Monte Cabane. There are three types of apartment available in this retreat. The apartment Scirocco is quite large, all windows have mosquito nets and over the beds also hangs a mosquito net. The apartment Potente is a little smaller and it is suitable for two adults. Right behind the house, you can directly go to the hiking trails that lead over Marciana Alta in all directions. Each apartment has a living room with a sofa, a fully equipped kitchenette, and a private bathroom with a bidet. As well as a terrace, a flat-screen satellite TV, and air conditioning. Moreover, the double room Mistral has its own bathroom. In this retreat you dive into the silence of your consciousness. You turn your gaze inwards, fuel yourself in nature and give your body and mind rest. You arrive gently in the now and start to enjoy and feel more intense. In a safe atmosphere, you can be sensitive to your inner process and work on it. This program will be the same every day. The program can change if the group feels to do so. You are free to participate or creating your individual day-plan. It is about coming into the now and diving into consciousness. Every day we will practice meditation in the morning and late afternoon. 2 hours of silence and diving inside. Group activities as cooking, walking, swimming, talking about our experiences, lectures and time for parties and nice evening. 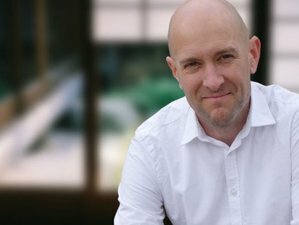 Gregory Stehle is an expert in meditation and self-exploration spiritual coach and process companion, he has 30 years experience in meditation, 11 years studying as a monk in one Buddhist monastery, 15 years coach and companion, and 5 years lecturer at the center for meditation and mindfulness. This retreat will take place on the beautiful island of Elba in Marciana, Italy. During this retreat, you will be served with daily delicious meals. We will cook for the group every day fresh and healthy food. I know what will support during the meditation and yogic practice. Cooking is energy and we will give love and silence to your cooking-practice. You will love it. The flights from Munich or Stuttgart to Pisa are super cheap. If you are coming from Pisa, you can join Gregor Stehle's own bus to the island. Starting in May, the silverairways will operate flights from Basel directly to the island. So if this information is public, then this will be the cheapest and easiest solution. Since Gregor Stehle does not refund any airfare, it makes sense to take out cancellation insurance or to book your flight only 42 days before the beginning of the retreat. The deposit is fully refundable if the booking is cancelled up to 42 days before the arrival date. Gregor Stehle is an expert in meditation and self-exploration spiritual coach and process companion.